Specialist Hammam treatments have long been part of the traditional and nourishing preparations ahead of a bride’s big day. Brides can now enjoy the experience with friends at Mandarin Oriental, Marrakech, with the new Bridal Hammam Ritual by marocMaroc. The ritual stars with a welcome to The Spa with songs and ‘youyous’ (the traditional celebratory call of Moroccan women). The hammam experience begins with a hair treatment using argan oil, followed by a black soap body wrap and scrubbing with a Kessa glove. 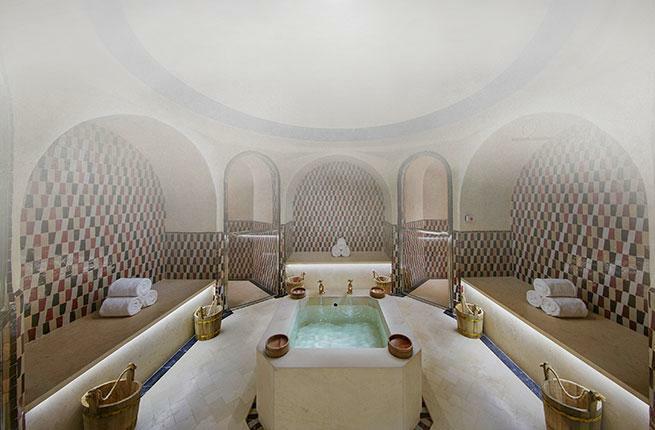 Once the exfoliation is complete, the body is rinsed before the hammam ceremony closes with an orange infusion rubbed into the skin during stretching. After the hammam ceremony, the bridal party are invited to the relaxation lounge to enjoy Moroccan mint tea and traditional refreshments. The last stage of the experience is a signature massage for the bride before re-joining her bridesmaids to complete their celebrations with cocktails and traditional Moroccan music.